Tom Hanley of Lockheed Martin checks out student’s bottle rockets to make sure they are within competition regulation. 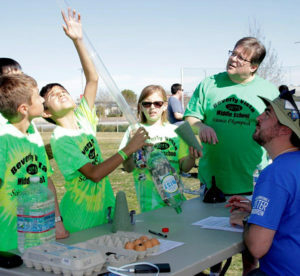 More than 1,200 students participated in the 5th annual Science Olympiad at the Antelope Valley College. Eighty teams partook in events such as Elastic Launch Glider, Anatomy & Physiology, Invasive Species, Mission Possible, Meteorology, Astronomy, and Experimental Design. 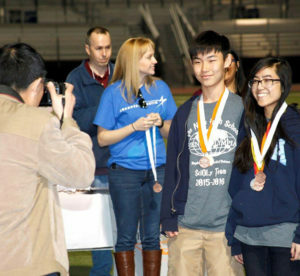 Science Olympiad has been a premier national STEM competition for middle and high school students for more than 30 years. Each state hosts regional tournaments and the winners participate in a statewide event, moving to the annual national competition in May. The top five overall teams from the Aerospace Valley regional that will advance to the state completion in April, at the Caltech campus in Pasadena are: Division B: Dana Middle School, Lone Hill Middle School, Jacobsen Middle School, Beverly Vista School and Lincoln Steam. Division C: West High School, Westlake High School, Oak Park High School, Van Nuys High School and Beverly Hills High School. 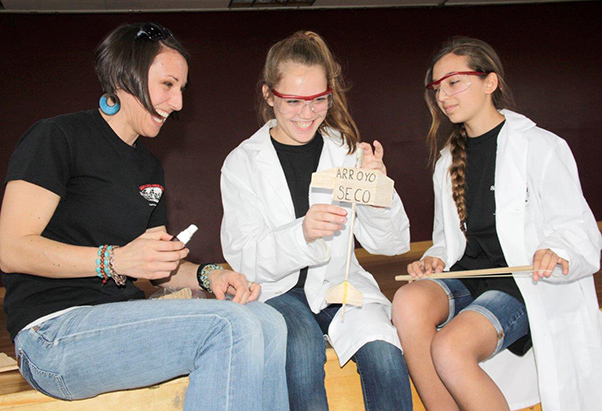 Courtney Koezle, an 8th grade science teacher at Arroyo Seco (Valencia) helps students Elizabeth Williams and Millisa Stanley repair their elastic launch glider during the 5th annual Reginal Science Olympiad. Five years ago Lockheed Martin and NASA approached the AVC and asked if they would be interested in supporting a STEM program that would attract as many students as possible. At the same time, the Los Angeles County Board of Education asked if they would host the regional STEM competition. “We had great support from our community and we grew quickly,” said Christos Valiotis, professor of physics and director of the regional Antelope Valley Science Olympia competition. AVC professors worked together with Lockheed Martin and NASA STEM specialists to prepare tests and competitions. “I like the fact that it is such a great success and we grew to what we have here today, but I do miss being able to see every competition and visit every tent,” said Valiotis. It appears that Valiotis was born with STEM in his DNA. 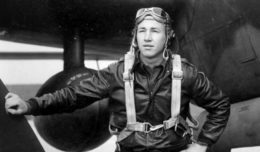 “As a young boy, I was continuously destroying and building things.” As he got older, Valiotis needed to know how things worked, so he shifted from engineering to physics. Happy day — Parents and teachers take photographs during the awards presentation at the 5th annual Science Olympiad at the Antelope Valley College. “This competition is valuable on so many levels,” said Courtney Koezle, an 8th grade science teacher at Arroyo Seco (Valencia). The event is funded and organized by AVC with significant support from the Lockheed Martin and NASA. The Los Angeles County Office of Education provides logistical support in supervisor training and handles scoring during the event. “We definitely could not pull it off without our volunteers, parents and our generous community,” said Valiotis.